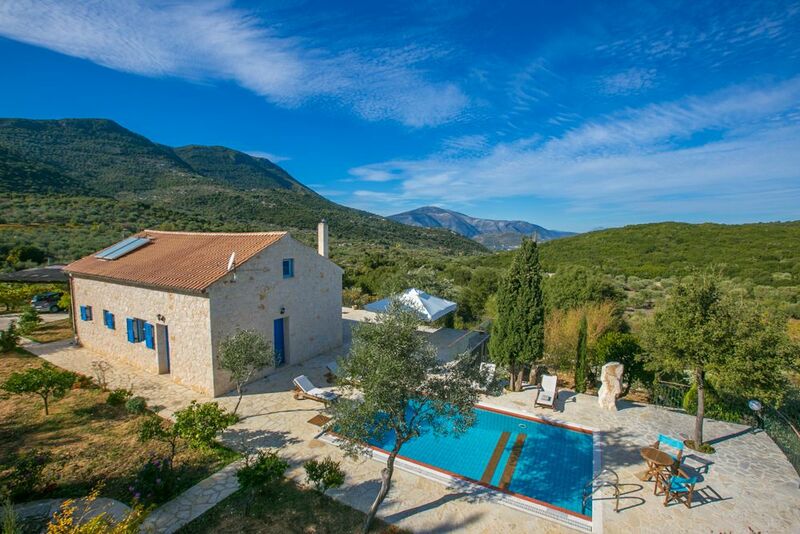 With gorgeous views across silver olive trees towards rolling hills and the sparkling Ionian Sea this relaxing and welcoming country house sits on a gentle rise in the land and is a great choice for anyone seeking an unspoilt rural location whilst remaining close to the coast and excellent amenities. The island capital, Vathy with its selection of shops, bars and tavernas is only 2.5km away and the pretty cove beach of Kaminia at 1.5km, closer still. A fresh and spacious ambience graces the interior which is crisp and contemporary, fully air conditioned and sympathetically decorated throughout using blue as the accent colour. A high beamed ceiling and walls of exposed limestone catch the eye in the open plan living/dining area, comfortably spacious with plump sofas, a feature corner fireplace and French doors to the exterior terraces. A fully equipped kitchen with dining table sit to one side. Styled with a modern, colourful mix of soft Mediterranean blues and yellows each of the two bedrooms, a twin and a double, have private doors to the terrace. Two bathrooms (including one en suite) complete this property’ well-balanced facilities. A splendid array of Mediterranean shrubs, plants and trees adorns the grounds and terraces and there is no shortage of space in which to relax in the sunshine around the wonderfully appealing private pool. A substantial stone barbecue and twin bench seating ensure outside dining will be fully enjoyed. Larger families or perhaps a group of friends looking to holiday together, whilst fully retaining individual space and privacy, will be interested to know that sister properties Naias and Eos sit above this property within easy walking distance. Each, like this property itself, completely self-contained, in their own independent and private grounds. Famous in Greek mythology as the home of Odysseus, Ithaca remains a peaceful ‘get away from it all’ island. Just 27km long, its varied terrain boasts hiking in the mountains and numerous attractive cove beaches - such as Sarakiniko (5.5km) and Agios Ioannis (11km) – along the coast. Consider hiring a little boat in Vathy, a hugely enjoyable way to explore the fascinating coastline and discover a little bit of the island that can be exclusively yours for the day! And do try the local cuisine. Savoro fish (served with tasty herbs, olive oil and vinegar) and lamb kleftiko regularly feature on taverna menus while sleepy Perachori (2.9km) is as well known for traditional ‘souvlaki’ as it is for sweeping panoramic views. Not having its own airport, we recommend flying into the neighbouring island of Kefalonia. From Kefalonia airport there are a number of options to get to Ithaca (which we can book for you). This villa, in Perachóri, boasts a gorgeous sea view sleeping 4 people. The villa offers superb accommodation, including modern luxuries such as a swimming pool, DVD player, television, air conditioning and internet access.